Originally, ordination was passed down from teacher to student, beginning with Moshe and continuing throughout the generations. This original ordination had a number of rules, as described by the Rambam (Mishneh Torah, Hilkhos Sanhedrin ch. 4). One important rule is that ordination can be given for ruling on specific areas of Jewish law and need not be given for everything (par. 8). However, a candidate must be qualified for all areas in order to receive even limited ordination. Someone halakhically unqualified to rule in all areas may not receive any ordination. Thus, for example, someone blind cannot be a dayan (Hilkhos Sanhedrin 2:9) and therefore may not receive even limited ordination (ibid. 8:10). Click here to read moreThis chain of ordination ended sometime in the Talmudic era, after Hillel II established a fixed calendar (cf. Ramban's glosses to Sefer Ha-Mitzvos, aseh 153). The question remains what kind of ordination remains beyond that point. More importantly, what it means today. The Rema, R. Moshe Isserles, writes in a responsum (no. 24) that we should still follow the rules of ordination even if they do not technically apply. In other words, the ordination we have today is essentially a replica of the original ordination, continued as a memorial. Similarly, the Chasam Sofer (Responsa, Even Ha-Ezer vol. 2 no. 94) ruled, based on this responsum, that we cannot give limited ordination to someone halakhically unqualified for everything (although he understands the definition of limited ordination differently). However, the Rema follows a different view in Darkhei Moshe and his glosses to Shulchan Arukh (Yoreh De'ah 242:14). He rules like the Rivash (Responsa, no. 271) that ordination today is totally unrelated to the original type of ordination. Rather, it is permission from a teacher to a student to issue halakhic rulings. Therefore, rules such as that against limited ordination to someone halakhically unqualified for full ordination do not apply. While the Chasam Sofer seems to assume that the Rema's responsum is definitive, R. Meshulam Rothe (Kol Mevaser, vol. 1 no. 12) argues that the ruling in Darkhei Moshe and Shulchan Arukh were written later and represent the Rema's final view. Despite this, R. Rothe prefers the former view and recommends convening a rabbinic gathering in Israel to institute a rule that limited ordination not be given. The Arukh Ha-Shulchan (Yoreh De'ah 242:29) accepts the Rema's view in Shulchan Arukh that ordination is permission to issue a halakhic ruling. However, he adds that in his time ordination took on a slightly different meaning. 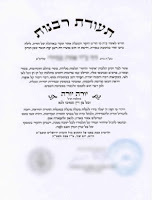 Rather than just being permission to rule on halakhic matters, it is certification to serve as a communal rabbi ("this is the primary function of ordination today"). This is a subtle but crucial distinction. According to the Rema (in Shulchan Arukh), anyone qualified to issue halakhic rulings can be ordained. According to the Arukh Ha-Shulchan, only someone qualified to be a community rabbi can be ordained. Even if limited ordination for someone halakhically unqualified for everything is possible, someone unable to fulfill the primary role of ordination cannot be ordained. I do not believe that ordination implies a qualification to teach Torah because we regularly find people who are not rabbis teaching Torah. This all seems to me to be a sociological reality that is consistent with the Arukh Ha-Shulchan's approach. If that is, indeed, what ordination implies, then someone who cannot serve as a dayan or synagogue rabbi cannot be ordained as a rabbi. This is within the view of the Rema (in Shulchan Arukh) and the Arukh Ha-Shulchan. According the Rema's responsum and the Chasam Sofer, there can be no limited ordination to someone halakhically unqualified for full ordination. What is the current custom regarding ordination? In practice, do we follow the Arukh Ha-Shulchan or Chasam Sofer? We ordain converts. This is problematic according to the Arukh Ha-Shulchan because converts cannot serve as synagogue rabbis (see this post: link). There is no problem of limited ordination, according to the Nesivos Ha-Mishpat (7:1), because a convert can serve as a dayan for other converts. Therefore, it would seem that the custom is to follow the view of the Rema's responsum and the Chasam Sofer. Either view, though, would preclude the ordination of women.